In October 2013, Morcheeba released their new album “Head Up High”, their second since reuniting with singer Skye in 2010, and they lined up an extensive European tour for the autumn and winter to promote the album. 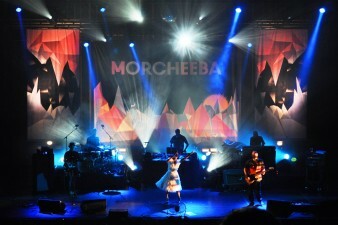 Martin’s Lights has worked with the band’s lighting designer Cate Carter since 2012, assisting her with James Morrison shows, she asked us to do the same with Morcheeba, and we supplied lighting direction for eighteen of the band’s shows across thirteen countries in venues from 500 to 3000 capacity. Cate designed a “double” backdrop for the tour, utilising a new laminating technique from drape manufacturers Hangman. 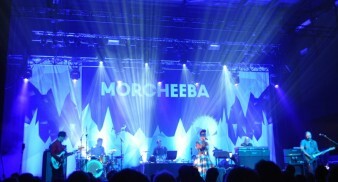 The backdrop, six metres wide by four metres high, is based on the album cover artwork, and when lit from the front appears black and white, taking the colour of the lights with which it is lit. When lit from behind with the tungsten flood lamps carried on tour, it reveals the full, multi-colour version of the artwork. Two additional backdrop legs, two metres wide by four metres high, continued the theme, allowing the backdrop to adapt to the wide variety of stage sizes encountered on the tour. The other lighting fixtures carried were ten GLP Impression LED moving lights used to light the backdrop from the front and to backlight the band, and a pair of Source Four profiles to side light singer Skye. Lighting control was from a ChamSys MQ100 console with an Extra Wing, and each day the programmed show was “morphed” to suit the venue’s lighting systems, which varied widely from a few Parcans to dozens of brand-new moving lights! The tour started in Prague in the Czech Republic in October, ran for three weeks, then it took a short break and reconvened in Spain in early December, finishing in Athens, Greece, on 14th December.